Though the demonstration was the same as Sony’s showcase, it was quickly obvious that many things were different. Instead of a warm summer day, the world was powdered with snow, and the wolves Deacon had to worry about weren’t there. Events in the game are completely unscripted. These are non mission specific moments that can happen at any point. Take for example the rope that clotheslines Deacon and sends him toppling from his motorcycle, creating a perfect opportunity for some bandits to attack. This time, the wolves don’t distract Deacon and he can catch the trap before running headlong into it. Taking a path around the back, he kills the two bandits lying in wait, actually cutting the rope and using it to strangle one of them out. After this we see him sneak into a small encampment and lure an enemy to a bear trap that he placed. One of the other bandits gets frustrated with the injured man’s yelling and shoots him so that the freakers aren’t attracted to their location. This is a wholly dynamic moment, a world that is playing out around Deacon with or without his involvement. Arriving at the main camp, the swarm of freakers used in the stage demo wasn’t there this time, so they couldn’t be utilized as a distraction. Our private demo took us through a decidedly more boring route of clearing the camp with sniper kills and stealth that turns into a third person shooter firefight before ending, but did effectively highlight the world as alive in ways that will fundamentally change how you need to play. The developers wanted to make it very clear that these dynamic junctures could happen at any point. That rope trap could be slung across any part of the road at any point in time during the game. The day and night cycle, the weather cycle, and placement of enemies both humans and freakers will change as the active and living world moves around you. The interactions between the group of bandits that had to kill one of their own are unscripted. Don’t expect that every enemy who gets caught in a bear trap will be shot by one of their buddies. 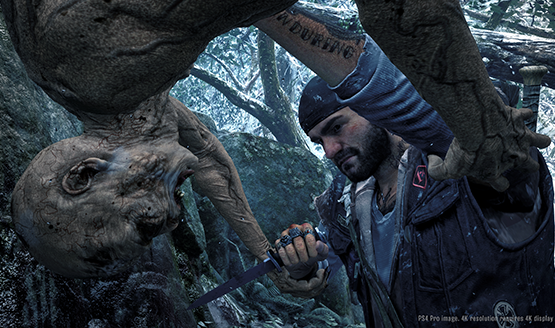 A swarm of elements will factor into how each and every moment of Days Gone plays out. Bend has even hinted that the freakers are not undead. They are infected that need to eat, drink, and sleep, and those types of things may end up also impacting the living world. Not focused on during the demonstration were the crafting, level up, and resource management systems. It’s not clear what exactly leveling up does for Deacon at this point, but crafting on the fly allows him to hobble together things to use in various situations, and resource management can be seen in the motorcycle’s gasoline level. 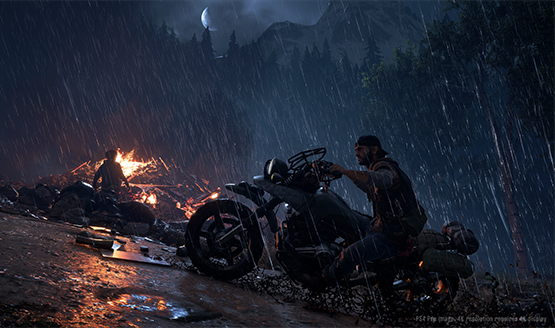 Deacon is a member of a biker gang, and Bend teased that the bike would play a very prominent role throughout the course of the game. There’s one small part of Days Gone that still concerns me, and that’s the humanity of Deacon St. John. I’m sure he’s got a compelling enough reason to be palling around the infected wastes of the Pacific Northwest, but I haven’t seen it yet. 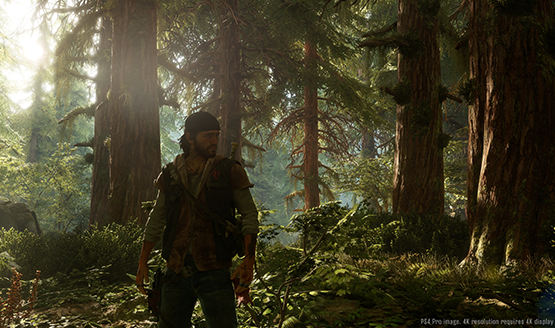 Survival for survival’s sake has often turned me off to many potentially great narratives, and I hope that future showings of Days Gone focus more on why we should actually care about what Deacon is doing. I just hope it’s not for the sake of saving a little girl. I feel like that particular post-apocalyptic storyline is a hackneyed trope we’ve seen too often before. Check out all of PlayStation LifeStyle’s E3 2017 coverage.